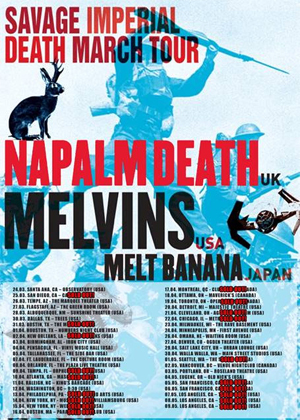 UK Grindcore pioneers NAPALM DEATH are currently on a massive and extremely successful touring campaign across North America as part of the "Savage Imperial Death March Tour" together with THE MELVINS and MELT BANANA. Plenty of shows have been sold out already, so act fast to get your tickets for the remaining dates. NAPALM DEATHShane Embury checked in with the following status report: "This ongoing tour with MELT BANANA and the THE MELVINS has been awesome! A really great vibe between all 3 of the bands with a lot of the shows selling out which is great to see. The diversity of the fans and the musical styles of the bands on offer for me is really refreshing! I also got to play "Night Goat" live with THE MELVINS, which for me is one of the best songs ever! But for sure this kind of tour is inspirational food for thought as I look towards writing for the next NAPLAM DEATH album!"